Sampurn Anand, the founder of India’s first and only platform for Indian events in the world. Sampurna decided to start this event marketplace with his co-founder and friend after discovering the pain point of NRIs i.e. lack of a place where they can search for Indian events and buy tickets. But this is not all about our young entrepreneur as besides connecting dots in business world he is a professional writer with formal education related to Directing, Directing, screenwriting, production, editing and has momentous experience in television broadcasting. Before starting TicketHungama.com he has also served as vice president – Programming & Development for International Television Broadcasting Inc. His journey depicts versatility and that’s the dominating trait of his personality too. Learn more about Sampurn Anand in the interview ahead. In plain and simple words – TicketHungama.com is an event marketplace for NRIs. Our platform is very straight forward: organizers can create their event and using our services sell their tickets and track their sales while buyers can book tickets hassle-free in just 3 clicks. It’s a very strange fact that in countries like US, Canada and UK, NRIs have to go through yellow pages sites in order to book Indian Event Tickets. It’s so irritating to scroll through tons of listings related to Roommates, cars, hosting, jobs and things like that in order to find the event and book the tickets. 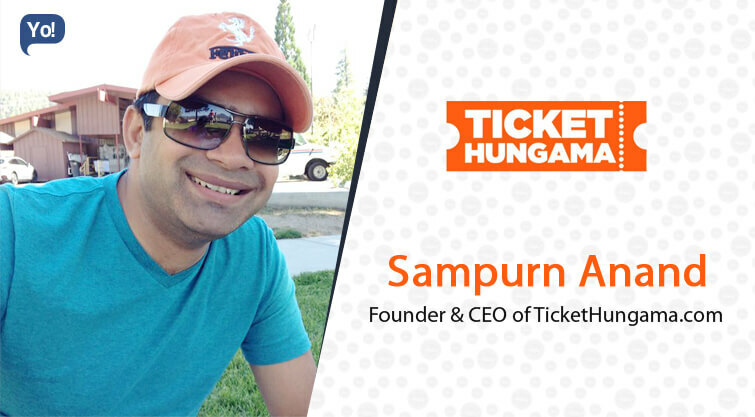 Me and my co-founder Anar Anand were so sick of the user experience that we decided to do something about it – hence, TicketHungama.com was born – an Indian event marketplace. There is no fun without risk! The most challenging part of our journey has been to get right people to join us and work with them remotely. First of all, you do not get the people who are as passionate about your project. And when you do find them, they are half the globe away from you and work when you sleep and sleep when you work! Since our team is based in 3 continents and 4 different time zones, supervising work and co-ordinating has been the most challenging task we have undertaken so far. We have witnessed many sleepless nights in order to see the work through. There are software engineers who have been working with us for last year and a half and we have never met personally. Our only interaction with them has been online. Its as exciting an experience as it is scary. As a start-up, everything that can go wrong, does go wrong. And we overcame all these issues with only one thought – failure is not an option. Today when we look back at things that we have done in order to keep ourselves afloat, we sigh and say – really, did we do that! So far, me and my wife have put in our own money in the business. But we are in talk with some potential investors in order to take the company to the next level. We will make the announcement soon. Its very easy to get brain drain with a start-up. And hence, we have devised our very own way of keeping the team entertained. Since we have a remote team, we do regular video games contests. Teams play with each other online and winners go back home with prizes. This not only keep them entertained, it also encourages the team effort. Additionally, our work culture is such that we do not have a working hour. We encourage people to work whenever they are available. This practice not only make team members being answerable to their own selves, it also prevents them from burning out. Perseverance, Perseverance, and perseverance… If you master this quality, you can conquer everything else as an entrepreneur. From sales perspective, I use the CRM a lot. In addition, I would recommend productivity apps like Wunderlist, Evernote and Dropbox. They really help one keep organized. Spending time on Social Media. Be obsessed with one’s own idea. Never avoid your first instinct. To take TicketHungama.com to UK, Australia and Middle-East. I will start my ventures in my 20s. South Africa, New Zealand and Malaysia.